Every so often there is a new book that comes out which is a GAME CHANGER!. THIS book is one of those resources that EVERY landlord should have. When you first look at The Fee Bible, you might assume we want to nickle-and-dime every tenant and customer we have. This is far from the truth. Over the years, we have learned that the right charges can help manage the property, save time, and increase revenue. In most cases your customers will actually thank you for these additional options. 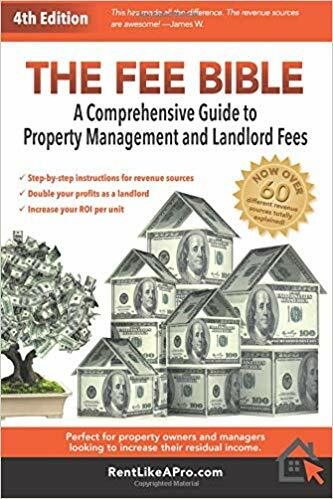 This book is a MUST-READ for both the novice landlord and the experienced property manager because it takes a broad view of both basics and more innovative approaches to services and fees. The services outlined allow you to manage rental properties more efficiently, provide better service, and actually get compensated for your work. The authors have over 20 years' experience in residential property management. They teach at various apartment associations and landlord organizations. In fact, we are also excited that they will be joining us at our 18th Annual MrLandlord National Convention. They have managed thousands of properties from single family homes to multi-family complexes. They have helped and trained many landlords and property managers increase their income and improve their management systems. Order this resource today for only $22.49 plus FREE shipping!